The United States beat the International team 15½-14½ to win the Presidents Cup for the sixth time in a row and ninth time in 11 contests. The US held a one-point lead going into the final day's 12 singles matches and maintained that advantage at the Jack Nicklaus Club in Incheon, South Korea. 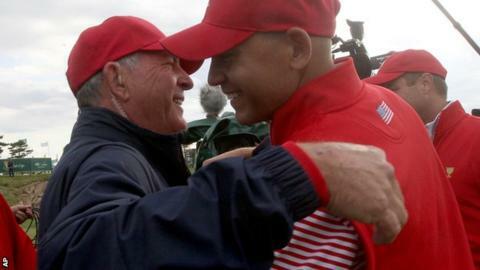 Bill Haas, the son of captain Jay, scored the winning point by beating South Korean Bae Sang-moon. Haas secured victory on the 18th hole of a tense finale to the competition. Jay Haas said he told his 33-year-old son: "Come on, win one for your mom, your mom deserves this." He added: "We put him out 12th and had no idea this was going to happen. Couldn't even have dreamt this." Sang-moon needed to win the final hole to halve his match with Haas Jr, but conceded after following a poor chip into the 18th with a missed putt. The 29-year-old will now begin two years of compulsory military service in South Korea. Haas was the fifth American to win his singles match, with Dustin Johnson, Phil Mickelson, Chris Kirk and Zach Johnson doing likewise. Adam Scott, Hideki Matsuyama, Steven Bowditch, Marc Leishman and Branden Grace were the International winners, with two matches halved.